"Centre for Hybrid and Organic Solar Energy University of Rome “Tor Vergata” "
Aldo Di Carlo is full professor of Optoelectronics and Nanoelectronics at the University of Rome “Tor Vergata” (Italy). His research activities focus in the design, fabrication and characterization of solution-process optoelectronic devices. Since 2006 he is co-director of the Centre for Hybrid and Organic Solar Energy (CHOSE) which involves more than 30 researchers for the development and industrialization of the organic and hybrid organic/inorganic photovoltaic technologies. 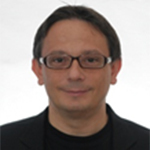 Di Carlo is author/coauthor of more than 300 scientific publications on international journals, 13 patents, several book chapters and co-author of two books of optoelectronics. In this communication I will present the efforts made to optimize the efficiency and fabrication technologies to scale-up Perovskite Solar Cells to large area modules. Two deposition techniques were used, namely spin-coating for substrates up to 100 cm2 and air-jet assisted bade coating for larger substrates. Laser processes were used to pattern the substrates and to remove the deposited layers for proper cell interconnections. The optimization of the air-blade deposition resulted in a module with a substrate area of 150 cm2 and active area of 100 cm2 with an efficiency of 9.3%. Spin-coating devices with a substrate area of 100 cm2 and an active area of 60 cm2 were also fabricated. An efficiency exciding 12% was achieved by proper optimization of Electron Transporting Layer. Stability of Pervoskite Modules under accelerated stress test will be also discussed.